Harvest time snuck up on us this year. There were warm autumn days, followed by a few rainy ones, one bright and sunny hot Thanksgiving day, and two days after the temperatures plummeted below zero. That same week, on Wednesday, late into the night, I had to rescue all the tomatoes, peppers, beans, and herbs that I could, and the following Saturday, the rest of the garden followed. Only the kale in the permaculture towers is remaining. We have grown lots and lots of cherry, grape, and pear tomatoes this year. Moving into our new place delayed our planting of tomatoes. They did not look very happy, so I planted more, hoping that some of them will survive. Little did I know that they all would, and after sitting there unchanging for some time, in two weeks, they went from small bushes into a giant tomato forest, eventually shading the entire herb spiral and pretty much everything else in the garden. They climbed the towers, the trees, the supports, the grape and cucumber vines. I managed to snap a few photos of the herb spiral before it got completely obscured by the tomato forest. It came as no surprise, since our yard is facing North and plants themselves have created so much shade for their own fruit, that this year we have lots of tomatoes that have not had a chance to ripen before the frost. So, I shall be ripening them inside, off the vine. 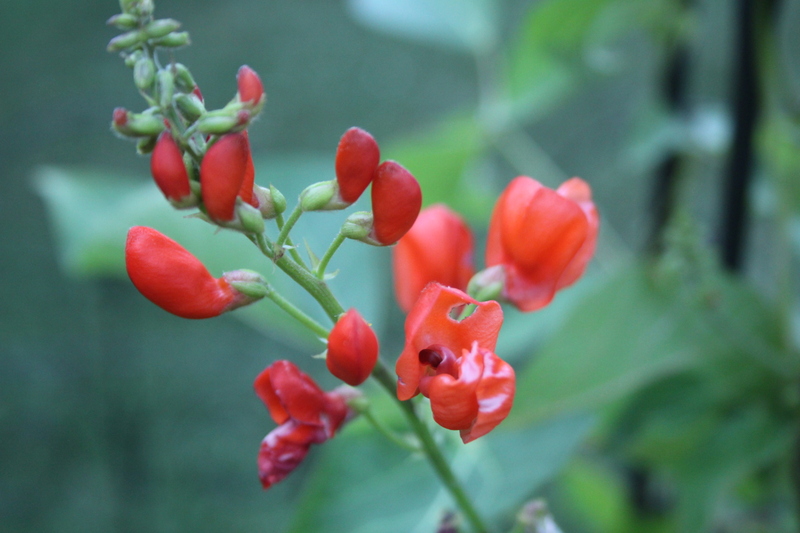 Scarlet runner beans loved it in our front yard, and had put out more flowers, despite the cold. It was a wonderfully relaxing activity one cold evening a few days ago, with my two-year old helping me peel them and delightedly playing with the pods. Similarly to last year, I have harvested a huge comfrey plant and have hung it to dry, along with lemongrass and stinging nettle, which is abundant in my new garden. Lemon verbena got replanted, and I’m thinking it will probably shed its leaves just like it did last year. 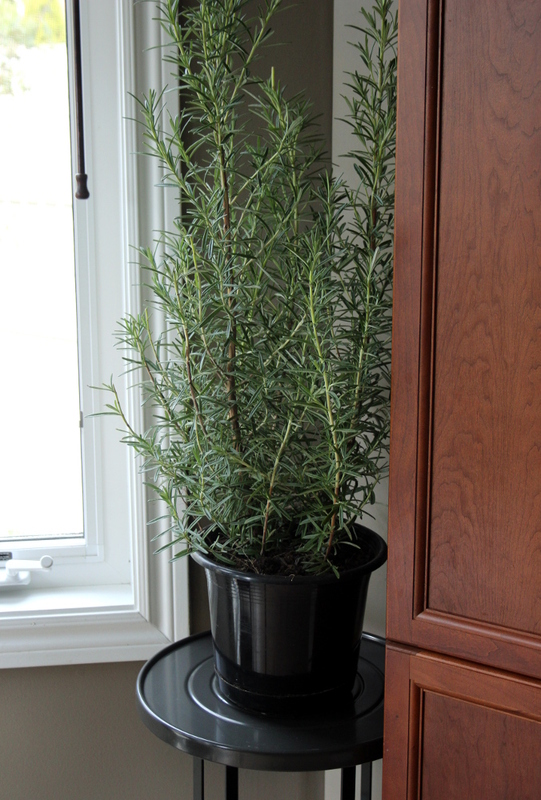 The huge rosemary plant, parsley, thyme and sage got replanted into pots as well. I’ve used basil extensively for cooking, and the pods have now dried, leaving me plenty of seeds. Arugula has given us many delicious leaves over the season, and more now when I have pulled it out. There are lots of seeds as well to save for next year. I have dug out several potatoes from the two bushes I have planted. They are delicious – most of them have already been consumed. There are some beets and cucumbers, as well as lots of juicy thick green onions I have used in salads throughout the summer, and have now chopped up and frozen for the winter. Lots of work over the past week to gather and process the harvest. More work to follow to save the seeds for the next planting season. 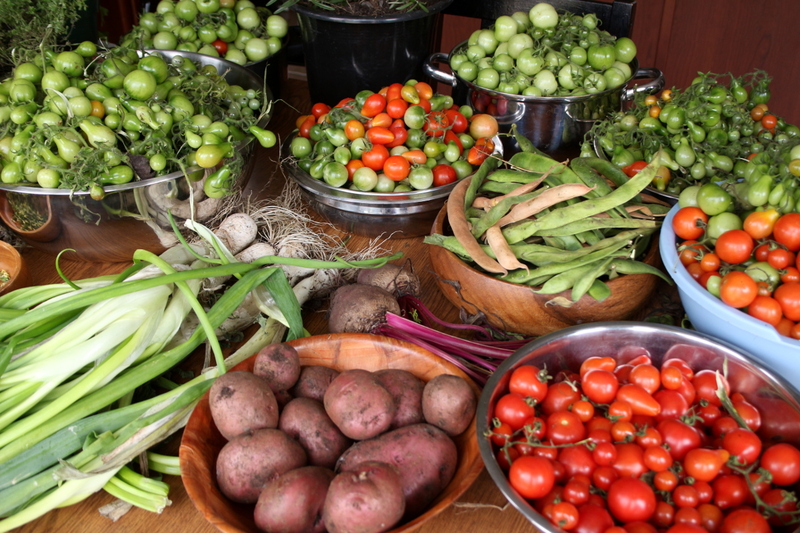 Many thanks to the soil, the sun, and the rain that have nourished our food so it can nourish us. We have moved to a new place at the end of May, which means I have a new garden to shape. 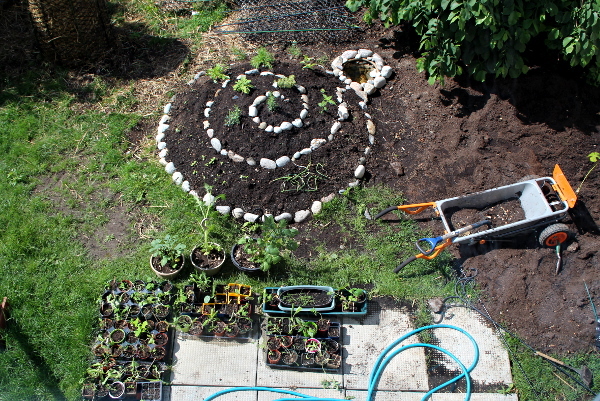 I have decided to try my hand at a permaculture herb spiral. The result looks lovely and the herbs seem happy. Our back yard is larger than the previous outdoor space we had, but there is a play structure, existing shrubbery, and three small trees, so I have to work around those. The soil is very sticky, full of clay and rocks which makes digging very difficult. These factors have stirred me towards rebuilding two of my permaculture towers to take advantage of vertical growing space and the fertile soil in the towers. 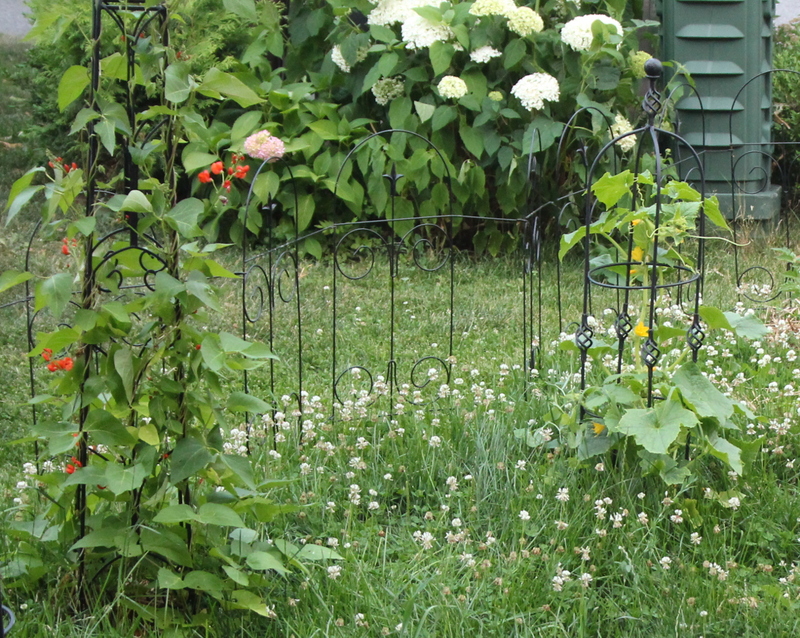 I have also put in a few plants at the front (disturbing the manicured lawn), a few along the far fence at the back, and a lettuce patch at the side of the house. 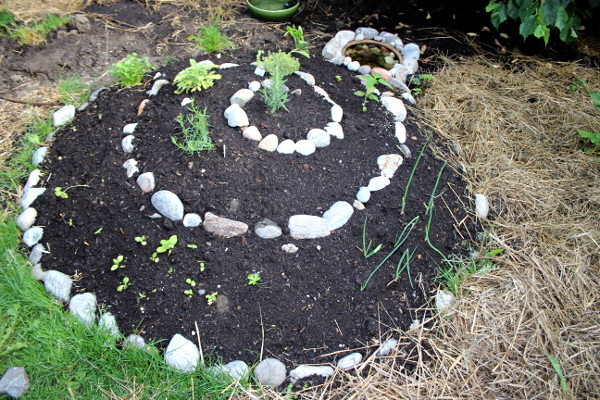 My experiment this year is the permaculture herb spiral. Last year, most of my herbs got overpowered by tomatoes and were far out of reach in the deep tomato forest. So, this year, I have decided to still plant some companion herbs and plants together (such as cucumbers and dill), while building the herb spiral to make the herbs more accessible and able to really thrive. I got the inspiration and theoretical basis for it online, and, as we were packing and moving, have arranged for the soil to be delivered and set out on an adventure with the kids to pick our river rocks and a few other supplies at a landscaping supply place. 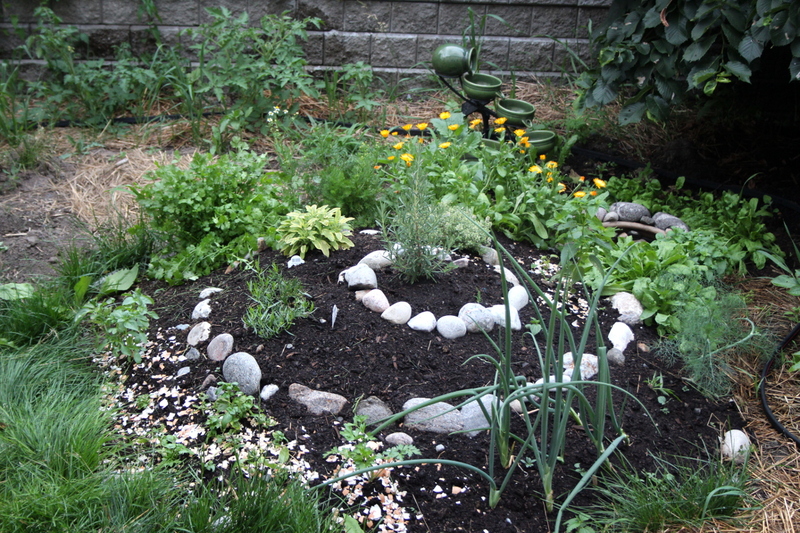 A permaculture herb spiral is aesthetically pleasing and, if done correctly, provides several micro-climates, each favouring different herbs, by combining elevation, soil composition, moisture retention, and sun exposure. Measure out a circle about 2 meters in diameter, with a string tied to a stick. Mark the circumference with a few river rocks. Lay out cardboard in a circle, to prevent grass from growing into the spiral (the back yard appears to have been a lawn before). Dig a pit for the pond and set the ceramic pot into it. 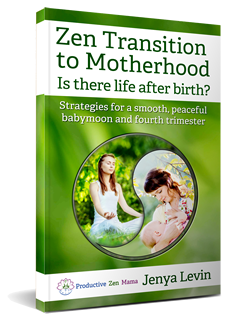 Lay out the full circle with river rocks, spiraling in, to create three levels of elevation. My son loved helping me out with this part. Fill up the space between rocks with soil, slowly building upwards. 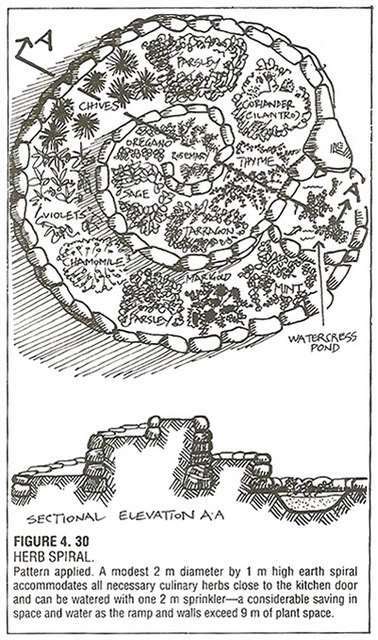 In the middle, put gravel instead of soil, so that the middle pillar of the spiral drains faster. Keep building up the inner walls so that the middle walls gradually rise higher than the bottom level. Use the soil to support the rock walls as they are being built. Mix soil with sand to fill up the top of the middle pillar. 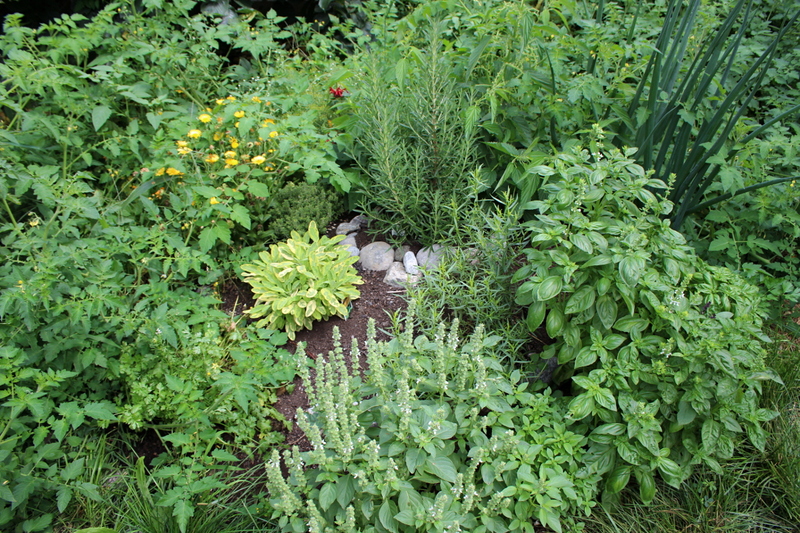 Mediterranean herbs like sandy fast-draining soil. Plug the ceramic pot with the cork, so it retains water. Lay river rocks around the pond and inside of the ceramic pot, creating layered rocky bottom for the pond. If frogs are ever introduced, they will find it welcoming. 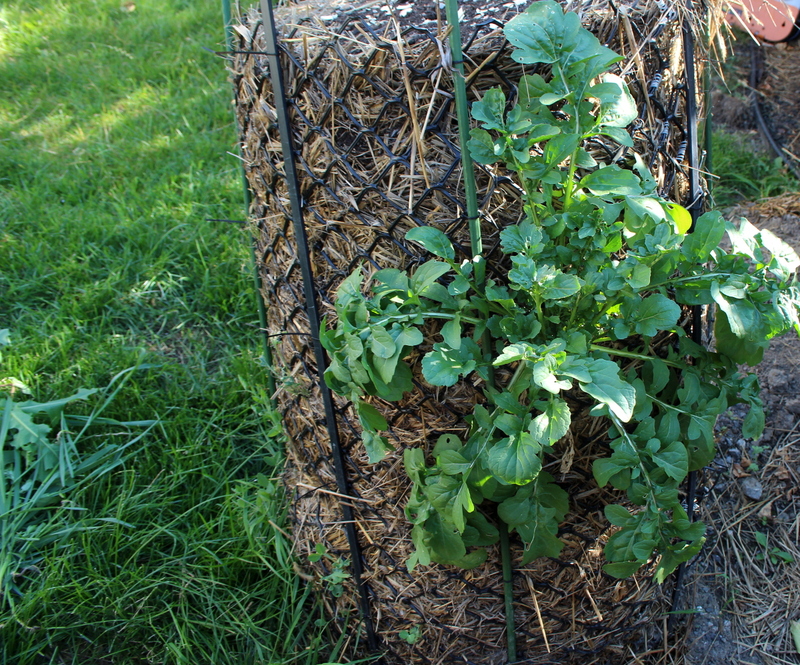 A small pot with watercress can be nestling in the damp rocks. Fill up the pond with water to the brim. Plant the seedlings — dry-loving ones at the top, spiraling down to the most moisture-loving ones. From the top, following the spiral, I have rosemary, lemon thyme, golden sage, tarragon, bergamot, calendula, chamomile, and cilantro from purchased seedlings, followed by Thai chili peppers, a variety of basil, parsley and onions sprouted in my old basement. 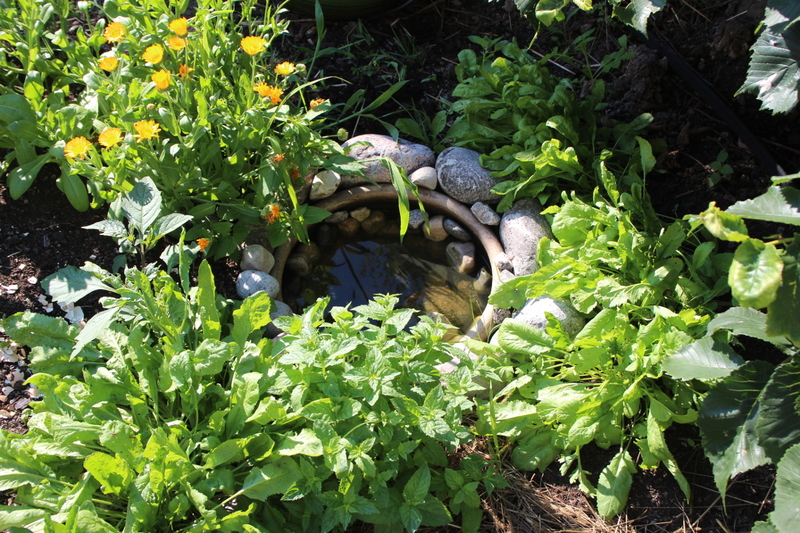 I have also placed some mint in a pot near the water so that it doesn’t take over the spiral as mint will, and have seeded Persian cress around the pond. I have purchased lemon grass and lemon verbena, but have decided against planting them in the spiral, since they grow quite tall. Instead, I have planted them around the porch, to help stave off insects. Last year, they grew very tall and made for quite a few cups of delicious tea. The view of the spiral is lovely from the kitchen and from the second floor window. It makes for a fun project to do with the kids, to watch the plants grow and observe the life in the pond.